Organisers roll out smart Wi-Fi to allow journalists to post 20GB video files during the annual racing event. 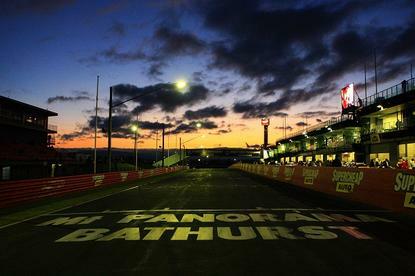 Dusk at Mount Panorama, Bathurst. Online news and video generated by 140 journalists covering the annual Bathurst 1000 race at Mount Panorama in Bathurst, NSW, this weekend will be on the Web much faster due to a new Wi-Fi network trial. The Smart Wi-Fi, provided by Ruckus, will allow media to post 20GB video files for their news outlets around the world as eager fans tune in to watch Ford drivers battle it out with their Holden rivals. The vendor has provided two ZoneFlex dual-band access points and a 1100 wireless local area network (WLAN) controller. Bathurst Regional Council LAN administrator Mark Gallagher told Computerworld Australia that while Bathurst 1000 event organisers had trialled Wi-Fi for media in the past, they had been unhappy with the performance and needed a more robust system. Another catalyst for the trial is Bathurst is not on the National Broadband Network (NBN) three-year roll out plan, according to Gallagher. “We get more media for Bathurst 1000 each year and the network can only handle so many connections,” he said. “If the [motoring] journalists go to Philip Island to cover MotoGP, they might have access to a very fast connection but here the best we can give them is 4Mbps simply because of our distance from the [Telstra] exchange and the infrastructure Telstra has,” he said. Gallagher said that Friday morning will be a very busy time for the network as media start to file videos/stories and he expects the network will be “flat out” until Sunday night when the Bathurst 1000 winners assemble on the podium for the traditional champagne and awards ceremony. Bathurst Regional Council has six IT staff with two of these personnel responsible for handling Bathurst 1000. “There is a wide range of services we deal with from telephone lines to asymmetric digital subscriber line [ADSL] connections,” he said. “We also provide help for the media contingent if they are having trouble accessing emails." This is the first time that the Bathurst Regional Council has done the Smart Wi-Fi trial with Ruckus. According to Gallagher, Ruckus was recommended by the Council’s IT consultancy firm, Hi-Tech. Looking to the future, he said that the Council may look at increasing Wi-Fi coverage to the administration building and pit garages at Mount Panorama. “At this point we have no plans whatsoever to give any of the fans wireless access,” Gallagher said.